Holiday Classics. Festive cookie shapes anyone can enjoy! Whimsical, wonderful…Hammer Song cookie cutters in 14 shapes perfect for ringing in holiday cheer. Get out your baking ingredients and warm your home with a batch of fresh made sugar cookies…cut into one of these fun shapes and have the whole family begging for more. You’ll love their old world look and feel – a true collector’s item. We decorated ours with royal icing in bright hues for the season. View Hammer Song cookie cutters HERE. Don’t forget to view our new Holiday catalog HERE. The holidays are here. Get baking! 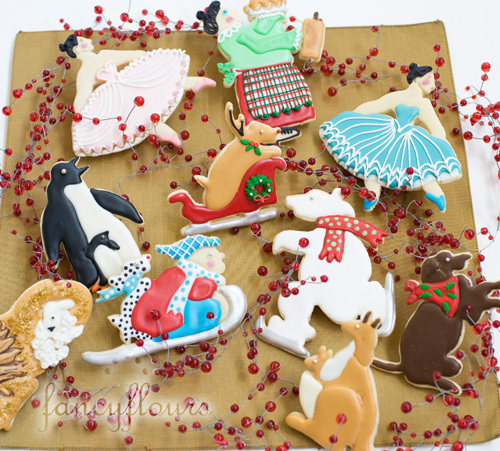 This entry was posted in Christmas Baking Ideas, Cookie Recipes & Ideas and tagged collector, cookie cutter, fancy flours, hammer song, heirloom, holiday, sugar cookie by Fancy Flours. Bookmark the permalink. I love Christmas cookies, they are the best!